Iron Neck training is uniquely designed to increase both neck strength and range of motion, in every position and across every plane of movement. It's worn on the head and can be used in conjunction with a cable pulley machine or resistance band and cinch anchor, as seen below. We have three models available. Iron Neck training is accomplished through two forms of resistance: linear and rotational. Linear resistance is applied via a cable pulley system or resistance band, which engages the neck in isometric training. 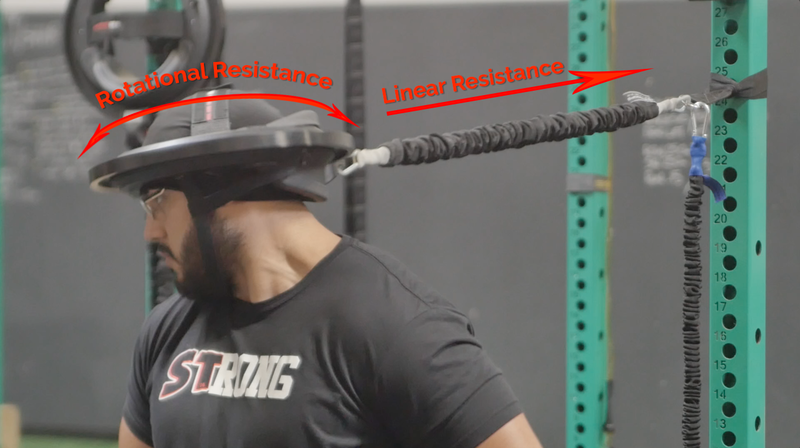 The ability to put the head in different positions through 360 degrees of facing movements allows you to train every muscle in the neck, while simultaneously engaging the core. Rotational resistance is applied through a braking system along the guide track of the Iron Neck, which engages the neck in concentric training. Think about rotational resistance as though someone has their hand pressed against your temple as you try and rotate your head. This works in the same way as a brake in a spinning bike. It's important to have Iron Neck properly fitted before beginning the workout. Start by tilting the Iron Neck forward and pressing your forehead into the front pad. It should be positioned so the bottom of the pad sits just above the eyebrows. Then pull the back of the Iron Neck over the back of your head and adjust the head strap to maintain position. Inflate the pump for a snug fit from back to front, then clip the chin strap. Finally, connect the cable pulley or resistance band to the Iron Neck, adjust the resistance source so that it's forehead height, and you're ready to go! Using Iron Neck for a Gym or Team? If you'll be using Iron Neck in a school/team, gym, or clinic environment, it's best to have a mix between Large and Standard fits to ensure everyone gets the most comfortable fit. If you have questions about what model selection or the right sizing mix, please let us know.